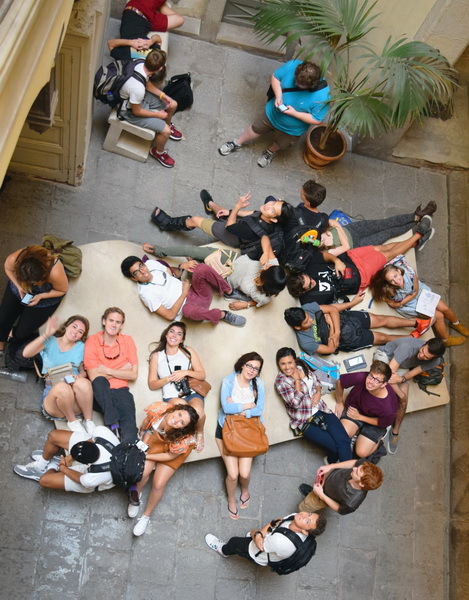 This Tuesday September 22, as part of our Fall 2015 Visiting Seminar Lecture Series lead by Mercè Berengué, students visited the Enric Miralles Foundation and the EMBT offices. The foundation is currently exhibiting “Urban Regeneration” showing eight EMBT projects; four of them done with Enric Miralles and four of them developed after his passing. These projects are also divided in four land projects, like the Santa Catarina Market in Barcelona and the Paris – Naples upcoming metro stations, and four water projects, like the port areas of Frankfurt and Bremerhaven. The visit was lead by the foundation’s staff and Mercè Berengué explaining and commenting with the students the exhibited projects, later on students had the opportunity to visit the EMBT offices located directly above the foundation, and as closure to the enriching visit, principal Benedetta Tagliabue joined in a direct conversation with students where they had a chance to discuss EMBT’s design process and current projects. F.C. Barcelona recently had a match against the Italian team AS Roma, a major match which drew the attention of the city. On the day of the match, people of all ages, friends and strangers alike, could be seen playing fútbol in the local parks in their FCB gear supporting their city. The regular season for FCB is from August to May and being in the city for a game is a cultural experience which makes anyone feel as though they are a local in the city. The celebration of la Mercè honors the Virgin of Grace (Mare de Déu de la Mercè), patron saint of the archdiocese of Barcelona. It has been an official city holiday since 1871, and is celebrated with cultural and artistic presentations held throughout the city. 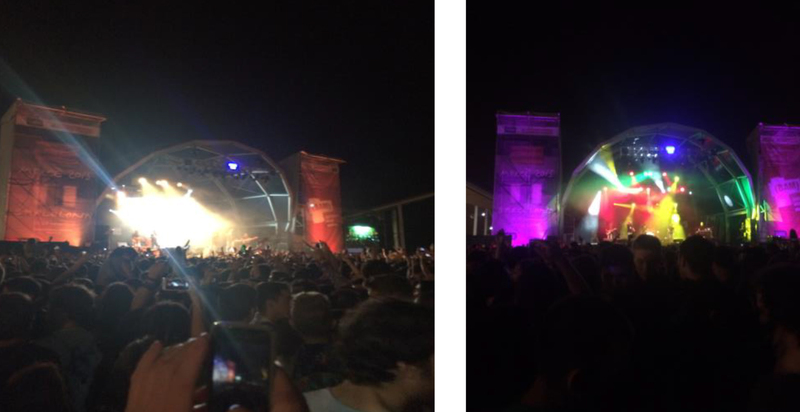 The week is filled with street parades, concerts, castellers and numerous other activities. Another bonus is that the metro runs all night during la Mercè. Spanish architecture studio BCQ has revealed its plans to enhance a Barcelona bridge, adding pollution­dissolving concrete, planted walls and paving that glows in the dark. Barcelona City Council asked BCQ to upgrade the road bridge that spans the Avinguda Meridiana, a dual carriageway that brings traffic into the city from the north, to turn it into a new gateway for the Catalonian capital. The aim is for the structure – known as the Sarajevo Bridge – to offer a more pleasant experience for pedestrians, through better lighting and improved air quality. This concert series in Barcelona’s MEAM (European Museum of Modern Art) unites the fine arts and music at the very highest level. The MEAM is currently located in the Palau Gomis, among the narrow streets of the Barri del Born in Barcelona. All the charm of Old Town is reflected in this neighborhood, where culture is always present. Tradition and modernity meet in the Barri del Born, a must for tourists interested in the monuments and museums Barcelona. For over two centuries, the Palau remained hidden in the heart of Barcelona, and now, it has been converted into a unique space that houses the collection of MEAM. The ticket includes museum admission and a concert. The Design Museum for the London Design Festival has numerous exhibitions, events, and projects from up and coming artists and designers. On exhibition right now until September 29th is the exhibition called Utopias and reality (Applied Arts and Design of the 20th Century). This exhibition has artifacts such as the Finn Juhl chair and drawings and the Nimbus motor bike, all to compare and investigate the changing of design methods and the idea of functionalism which was prominent throughout the 20th century. For the first time in the Turner Prize’s history an architectural collective has made it to the prestigious short list. It will be held at the Tramway, which is an international art­space which commissions, produces and presents contemporary arts projects. It’s goal is to inspire and add to our understanding of today’s world by connecting audiences and artists. For our History and Building Technology Seminars we had the privilege to visit ICTA- ICP, Research center, Campus UAB University of Barcelona. The building which is a research center is not only unique-looking but it is extremely efficient. I would recommend it in terms of its impressive means of sustainability found throughout the building. On Tuesday, we went as a class to visit the ICTA­-ICP Research Center and school campus. We learned about the buildings innovative outer skin of panels that are opened and closed by sensors that maintain a comfortable temperature inside the building. Aluminum inside of some of the panels helped to block out excess sunlight, which also contributes to the building’s efficiency. The interior rooms are organized around four atrium type spaces that bring lots of natural light into the space. As one of our site visits, Roger Williams University along with Clemson and Texas A&M went to Gracia, a generally mountainous region on the outskirts of the city. There we had a panoramic view of the city and could see everything from Sagrada Familia to the grid of the l’Eixample. This trip gave a picturesque view of the city while also giving insight on much of Barcelona’s urban layout and buildings. After our site visit to La Escocesa I began to sketch out ideas and think of my design approach to this site. I began to delve into the history of the site as well as make initial diagrams such as proposed entrances, public spaces, and programs according to my first impressions of the site. I am working individually to design my specific building while working with my colleague Matthew Russo to design a common public space that relates to both of our structures. This week in studio we had a presentation by Amadeu Santacana discussing his proposal for La Escocesa. This was a unique and inspiring lecture because it gave us insight on Amadeu’s approach to the same site which our project is on. We got to see the design process of his work and everything that he did to get to the final design presentation. This past week, some of the A&M students decided to go back for a second visit to La Escocesa to further analyze the existing program of the complex. Some of the things that I noticed on this second visit that I didn’t before were the changing pattern of the windows on the fab lab, and where the roof changed heights on the fab lab. These new observations will influence the form of my design, as well as inform the way I layout the program. 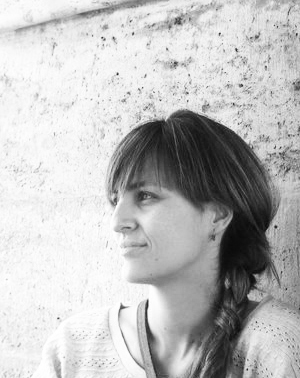 It is our pleasure to introduce Architect Anna Sala Giralt. She has recently incorporated our BAC faculty and will be accompanying us in our upcoming Fall 2015 Netherlands trip. Welcome to the BAC team! Masters Degree in Advanced Studies in Architecture by the ETSAB-UPC 2013. Currently working at the Fundació Mies van der Rohe in Barcelona as Architect and curator, she has a broad experience working in several architectural practices, publications and exhibitions like “Made in Europe”, in the Palazzo Michiel dal Brusà as part of the14th Biennale di Architettura di Venezia. Clemson Visited by Vice Provost Sharon Nagy. Last Thursday September 17, Clemson students had a special visit from Vice Provost Sharon Nagy. They had the opportunity to sit and talk about their experiences in Barcelona so far. Mrs Nagy, thank you for coming to Barcelona and we are looking forward to your next visit soon! 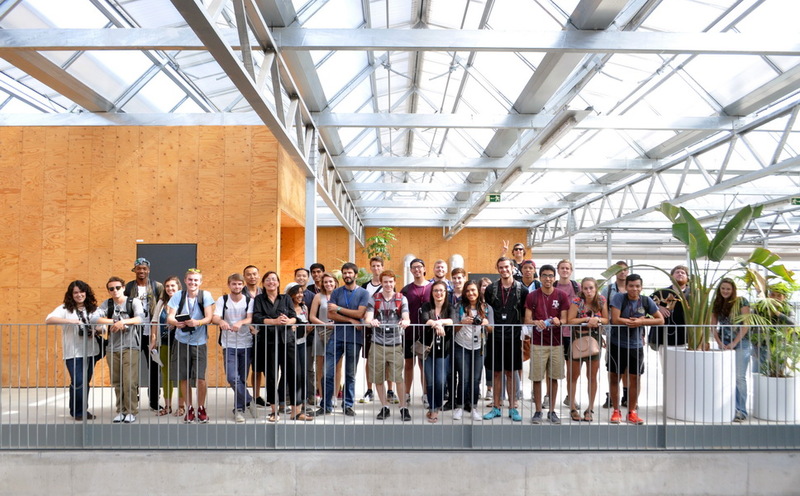 Last Tuesday September 15, as part of our Fall 2015 Visiting Seminar Lecture Series lead by Mercè Berengué, our students visited ICTA-ICP Research Center in the UAB Campus (Universitat Autònoma de Barcelona), a project by HArquitectes and DataAE. The visit was guided by Architect Roger Tudó from HArquitectes. Students had the opportunity to understand, explore and question this singular project that implements key construction systems and elements in the aim of creating a self susteinable building with a main focus on climate management strategies. Amadeu Santacana is principal in NUG, architectural practice located in Barcelona. In 2009 NUG won a competition to create a new Fabriques de Creació de Barcelona in the industrial complex of La Escocesa. He explains La Escocesa´s complex and layered history and urban context; concluding in the explanation of NUG’s emphasis in the importance of the actions that take place in the space over the visuals by approaching the project through 5 main strategies: 1. Bringing Bolivia Ave through la Escocesa. 2. Disconnect and free the industrial envelope from its program. 3. Making narrative cuts through the building. 4. Inserting systems that activate but not define the space.